Longing for the breadth and grandeur of a "Gone with the Wind" or "Doctor Zhivago"? A story, characters, and setting that will draw you in and hold you? This is the series that will do it! IMAGINE a "Gone with the Wind" story in 1790s Poland with the characters of Scarlett and Melanie reversed! That's what the author found not so many years ago, when he opened a long-hidden diary and stepped back into a turbulent Europe. Anna Maria and Zofia now beckon you to join them on a heart-stopping experience that contains "all the sweep and romance of 'Gone with the Wind' and 'Doctor Zhivago'." ~India Edghill, Author of "Queenmaker" and "Delilah"
Based on the diary of a Polish countess who lived through the rise and fall of the Third of May Constitution years, 1791-94, PUSH NOT THE RIVER paints a vivid picture of a tumultuous and unforgettable metamorphosis of a nation--and of Anna, a proud and resilient woman. 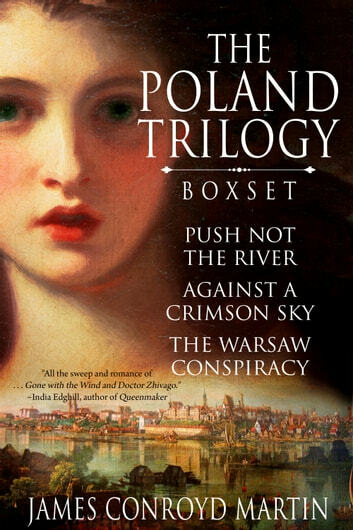 AGAINST A CRIMSON SKY continues Anna's saga as Napoleon comes calling, implying independence from her neighbors would follow if only Polish lancers would accompany him on his fateful 1812 march into Russia. Anna's family fights valiantly to hold on to a tenuous happiness, their country, and their very lives. Set against the November Rising (1830-31), THE WARSAW CONSPIRACY depicts partitioned Poland's daring challenge to the Russian Empire. Brilliantly illustrating the psyche of a people determined to reclaim independence in the face of monumental odds, the story features Anna's sons and their fates in love and war. Loved all 3 books. I never wanted to put it down. Enjoyed the storyvery much and the history of the people that I was totally unaware of. I was very disappointed when it came to an end!